So, do you think these guys ate the salads or the burritos? 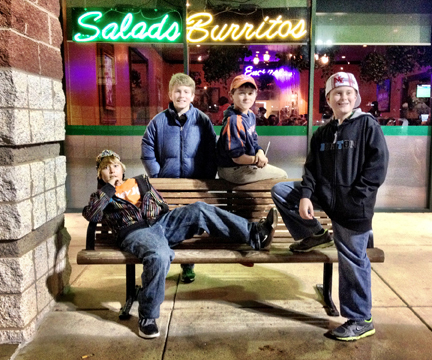 Well, since Cameron is in this shot, along with three of his friends (from left)—Cole, Rooney and Payton—I’m pretty certain the salads lost out tonight in favor of the gooey and cheesy choices on the menu at El Tio Tex-Mex Grill. Truthfully, there weren’t many greens consumed this evening when most of The Hill School’s sixth-grade class met for ice skating and dinner. As impressed as I was with Cameron’s first attempt on the ice, I have to admit that the service and food at El Tio was the most impressive part of the evening. Even when 18 children and about a dozen adults descended upon the restaurant in one fell swoop, the staff was accommodating and fit us all in. Somehow, they also managed to serve all of the food piping hot and delicious at one time and kept the chips and salsa flowing. Everyone finished the evening tired, full and happy and looking forward to our next sixth-grade outing! I love the shot…it looked like an ad for El Tio Tex-Mex Grill. Have a great week..and am now craving for a veg burrito…..! Thank you! Yes, the food is that good…I had fish tacos and they were divine! Aw man does that sound like a fun time!!! Love the photo Tricia !!! It was quite the experience! The kids are so fun at this age!